미국 뉴욕타임스에 스카우트된 한인 여기자가 인종주의 논란에 휩싸였다(be embroiled in a row over racism). 인종차별 발언을 한(make racist remarks) 것이 문제가 돼(give rise to trouble) 곤경에 처했다(land in hot water). 차별 대상(objects of the discrimination)이 백인이어서 더 거센 역풍을 불러왔다(bring about a fiercer backlash). 1988년 서울에서 태어나 세 살 때 미국으로 간 사라 정은 하버드 로스쿨을 졸업한 뒤 정보통신 전문기자로 활동해왔다. 지난해 언론 분야의 '가장 영향력 있는 30세 이하 30인'으로 선정됐고, 최근까지 기술 전문 매체 '버지'에서 일하다 스카우트됐다. 뉴욕타임스 이적 소식이 전해지면서 백인을 조롱했던 옛 트윗이 비난을 받게 됐다(come under fire for her old tweets mocking white people). 금세 논란거리가 돼(quickly spark controversy) 극우주의자들의 맹공이 쏟아졌다(rain down on her). 액면대로 놓고 보면(take them at face value) 그럴 만도 하다. "피부가 흴수록 더 멍청하다. 소화전에 오줌 누는(piss on fire hydrants) 개들처럼 내깔긴다. 유전적으로 햇볕에 더 빨리 타게 돼 있어(be genetically predisposed to burn faster in the sun) 기어다니는 마귀들처럼 지하에 사는(live underground like groveling goblins) 것이 낫다. 늙은 백인 남자들에게 잔인하게 구는 게 얼마나 즐거운지…." 뉴욕타임스는 옹호하고 나섰다. "뛰어난 실적(exceptional work)을 보고 고용했다. 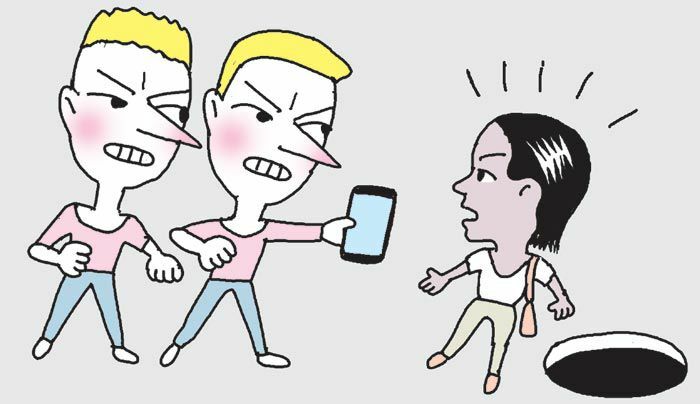 젊은 아시아 여성이라는 이유로 잦은 괴롭힘의 대상(subject of frequent harassment)이 됐다. 그래서 괴롭히는 사람들 어법을 흉내 내(imitate the rhetoric of her harassers) 대응하다 보니 그런 트윗을 하게 됐다. 채용 과정에서(during the hiring process) 솔직한 대화(candid conversation)를 나눴다. 그런 방식이 독설만 키울 뿐이라는(only serve to feed the vitriol) 사실을 그녀도 인정했다"는 성명을 발표했다. 사라 정 역시 개인 성명을 냈다(release her own statement). "유색인종 여성으로(as a woman of color) 숱한 증오에 맞서야 했다(face torrents of hate). 괴롭히는 자들에게 맞대응하느라(stand toe-to-toe) 풍자적으로 빈정댄(level a satire at them) 것이지만, 그들을 흉내 낸(mimic them) 데 대해 반성한다. 다시는 그러지 않겠다"고 밝혔다. 사라 정은 트윗에서 뉴욕타임스를 신랄하게 비난하며 비웃기도 했었다(harshly criticize and make fun of it). "돈만 많이 있다면(have a bajillion dollars) 사들여 일부는 해고해버리고 싶다"고도 했다. 뉴욕타임스 성명은 관련 언급 없이 "그녀가 앞으로 나아가는 편집국의 중요한 목소리(an important voice for the editorial board moving forward)가 될 것으로 확신한다"는 끝줄로 마무리했다.